By Rick Davis, Consumer Metrics Institute In their third and final estimate of the US GDP for the third quarter of 2016, the Bureau of Economic Analysis (BEA) reported that the growth rate was +3.53%, up +0.38% from their previous estimate and up +2.11% from the prior quarter. 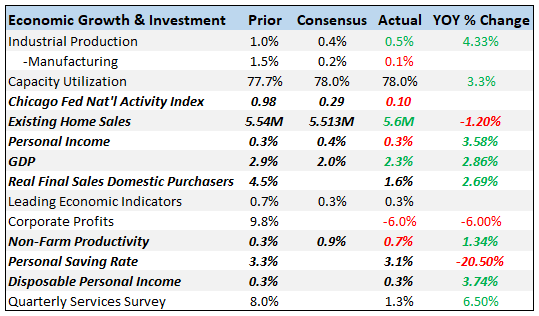 Follow up: The improvement in the headline number was broadly based: +0.14% came from higher consumer spending, +0.17% was from more fixed investment spending, and +0.09 of it came from additional governmental spending. None of the other changes were material, with the normally noisy inventory and import numbers completely unchanged. The BEA's "bottom line" (their "Real Final Sales of Domestic Product", which excludes inventory growth or contraction) recorded a +3.04% growth rate, up +0.38% from the previous estimate and now up +0.46% from 2Q-2016. Real annualized household disposable income was revised downward by a non-material quarter-to-quarter, to an annualized ,228 (in 2009 dollars). The household savings rate was revised downward -0.1% to 5.8%. For this revision the BEA assumed the same effective annualized deflator as last month, 1.39%. During the same quarter (July 2016 through September 2016) the inflation recorded by the Bureau of Labor Statistics (BLS) in their CPI-U index was 1.84%. In their third and final estimate of the US GDP for the third quarter of 2016, the Bureau of Economic Analysis (BEA) reported that the growth rate was +3.53%, up +0.38% from their previous estimate and up +2.11% from the prior quarter. The improvement in the headline number was broadly based: +0.14% came from higher consumer spending, +0.17% was from more fixed investment spending, and +0.09 of it came from additional governmental spending. None of the other changes were material, with the normally noisy inventory and import numbers completely unchanged. The BEA's "bottom line" (their "Real Final Sales of Domestic Product", which excludes inventory growth or contraction) recorded a +3.04% growth rate, up +0.38% from the previous estimate and now up +0.46% from 2Q-2016. Real annualized household disposable income was revised downward by a non-material $6 quarter-to-quarter, to an annualized $39,228 (in 2009 dollars). The household savings rate was revised downward -0.1% to 5.8%. For this revision the BEA assumed the same effective annualized deflator as last month, 1.39%. During the same quarter (July 2016 through September 2016) the inflation recorded by the Bureau of Labor Statistics (BLS) in their CPI-U index was 1.84%. Underestimating inflation results in correspondingly optimistic growth rates, and if the BEA's "nominal" data was deflated using CPI-U inflation information the headline growth number would have been lower, at a +3.14% annualized growth rate. The headline contribution from consumer expenditures for goods increased to a +0.77% growth rate (although it is still down a material -0.74% from the prior quarter). The contribution to the headline from consumer spending on services improved to +1.26% (which also remains down -0.11% from the prior quarter). The combined consumer contribution to the headline number was +2.03%, down a significant -0.85% from 2Q-2016. The headline contribution from commercial private fixed investments was revised to a positive +0.02, breaking a three quarter string of fixed investment contraction. The contribution from inventories was unchanged, although it is still up up a dramatic +1.65% from 2Q-2016 -- after a string of five consecutive quarters of contraction. It is important to remember that the BEA's inventory numbers are exceptionally noisy (and susceptible to significant distortions/anomalies caused by commodity price or currency swings) while ultimately representing a zero reverting (and long-term essentially zero sum) series. The positive headline contribution from governmental spending improved by +0.09% to +0.14%. This remained up an historically large +0.44% from the prior quarter, and it was entirely in Federal spending (state and local spending was still reported to be contracting). This momentary growth was almost certainly due to increased Federal fiscal year-end ("spend every last budgeted dime -- even if we can't possibly use whatever it is that we are buying") spending -- a recurring annual phenomenon that is accompanied by an offsetting fourth calendar quarter (first fiscal quarter) reversal of that growth. The contribution to the headline number from exports softened slightly to +1.16% (down -0.02% in this revision but up +0.95% from the prior quarter). Imports subtracted -0.31% from the headline number, unchanged in this revision but down -0.28% from the prior quarter. The "real final sales of domestic product" was revised upward +0.38% to +3.04%, up a material +0.46% from the prior quarter. This is the BEA's "bottom line" measurement of the economy and it excludes the reported inventory growth. As mentioned above, real per-capita annual disposable income was reported to have weakened very slightly quarter-to-quarter in this report. At the same time the household savings rate was lowered to 5.8%, -0.1% lower than the level recorded in the second quarter of 2016. It is important to keep this line item in perspective: real per-capita annual disposable income is up only +6.96% in aggregate since the second quarter of 2008 -- a meager annualized +0.82% growth rate over the past 33 quarters. The prior quarter's growth in consumer spending still took a major quarter-to-quarter hit. We believe that it is plausible that the "fear, uncertainty and doubt" (FUD) surrounding the election campaign contributed to lousy consumer sentiments and the corresponding consumer spending malaise. Although some portion of that has probably carried over into the current quarter, it may bode well for early 2017 as the "FUD" fades. A large share of the reported "growth" in Federal spending has most likely only been brought forward from the 4Q-2016. A 3.5% growth rate is impressive at any time, and it is especially so when domestic inflation is under 2% and comparable European growth is stuck at a rate that is a full 3% lower.